Prior to the birth of our little girl, my wife and I had great expectations for saving the Earth. We thought, so long as we used cloth diapers on our LG we'd never have to take responsibility for the mountains of trash filling up our nations landfills or that weird ever-growing island of waste out in the Pacific Ocean. 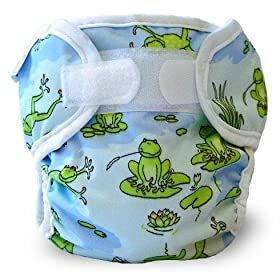 Yes, cloth diapers would be a way for us to look down on all of you disposable diaper users from our high horse and scoff at your complete disregard for our environment. And then, our baby girl arrived and our world was turned upside down. So what happened to all of those cloth diapers and our big plans for saving the world? Well, nothing. Sure we spent a small mint on a diapering kit and special detergents, but in the end we just couldn't bring ourselves to use them. Things were very stressful in those first few weeks, first the jaundice then the acid reflux, it was just too much to add cloth diapers to the mix...So in order to save face we quickly rationalized using the disposables as a means to keep our sanity, and gained a full drawer of very soft and very absorbent burp cloths. Hey but wait, it turns out all is not completely lost. As of this week we've turned the tides on pollution and have finally found the strength within ourselves to use our expensive cloth diapers. What made us do it? Simple, we're cheap. Yep, we did the math and all the convenience of those disposables does not make up for the amount of money we'll save over the first year of our LG's life. Don't believe me check this out. I believe everything I read on the Interwebs so I take this little nifty calculator as gospel. If that thing is right I'll save about $600 dollars this year on those cloth wonders. It's not the environment I'm worried about here, it's my wallet. I mean, sure I worry about the environment, I recycle, I don't drink bottled water, I spurn plastic bags whenever possible, and I throw out other people's trash when time and hand sanitizer allows, but let's be real, in this economy it's all about the bottom line. In the end, we're not sure how this cloth experiment is going to work, but since we've realized that everything about parenting is a challenge we figured why not tackle this one head on for a change, rather than getting blind sided by all those wonderful little surprises a new baby provides. If you're interested we're using Bummi's brand cloth diapering system that we got in a kit. And as for that special detergent, we're using Charlie's Soap when we wash the diapers. So far (even though I don't actually do the wash, god bless my beautiful wife!) I'm very pleased with it. Oh, how I wish Bummi's Brand Cloth diapering system was around when my girls were babies! I could have stopped feeling guilty about polluting the earth with all those disposable diapers! We, too, recieved cloth diapers as a shower gift, but they were the old fashioned kind. I was overwhelmed being a new mom and cloth diapers seemed beyond me at the time. Good for you for at least giving cloth diapers a whirl! I hope everything works out. You sound like you had a heck of a beginning with your LG. I hope everything has evened out now. I was going to say calmed down, but does life with a baby ever really calm down? ugh, I couldn't even bring myself to consider cloth diapers. They made excellent burp cloths though, and I now use them as cleaning cloths.